The mujahideen, the Taliban, and Al Qaeda do not represent thousands of years of Afghan culture and Islam. They are a direct reaction to Western imperialism. The root cause for the disparity between the two pictures is foreign intervention. Not Islam, and certainly not Afghan people. 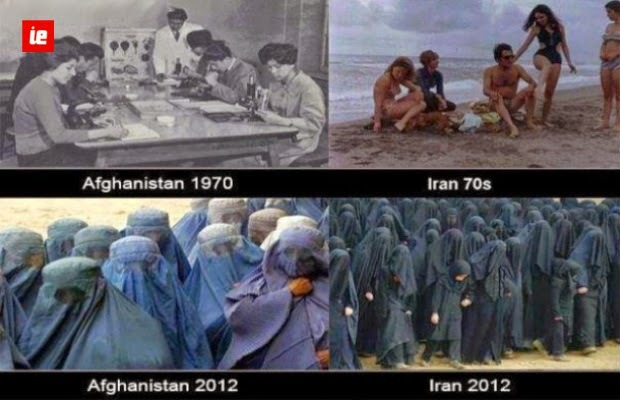 Second, here is a history on Iran. Before 1953, Iran was ruled under a democratically elected man called Mohammad Mosaddegh. Under his reign Iran saw a progressive movement of social and political reforms. During this time Britain tried to establish an oil company (British Petroleum) on Iranian soil, and promised to share profit and technology with the Iranian government. However the British, as usual, didn’t honor their agreement. They, and the United States, began to steal Iran’s oil. Prime Minister Mosaddegh would not stand for this and demanded the seizure of the oil fields and the ouster of the British. In response, the British and the United States overthrew him in a coup and installed the Shah who was a brutal tyrant and ruled the nation under an absolute monarchy. His security service, which amnesty international described as “the worst in the world” and “beyond belief” was trained by the CIA in torture techniques.